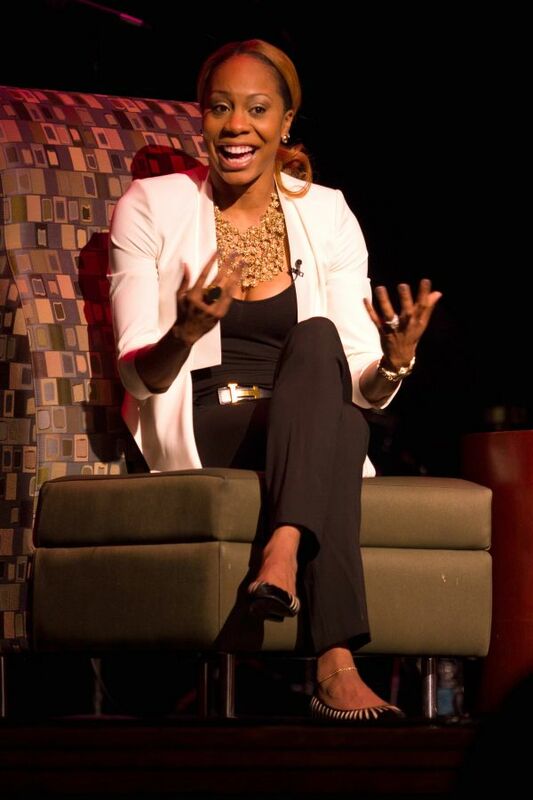 Sanya Richards-Ross talks to ISU student-athletes. The Redbird track team got a pep talk Monday as they prepared for next weekend’s Missouri Valley Conference Indoor Track and Field Championship at Northern Iowa, but it wasn’t from their coaches. It was from one of the most decorated female track and field athletes of all time, Sanya Richards-Ross, who won gold in the 400 meters in London last summer. Richards-Ross visited Illinois State on Monday to speak to more than 500 people at a Cultural Dinner celebrating Black History Month. Before the dinner, the Olympian spent 15 minutes with more than 60 student-athletes from Illinois State and its University High laboratory school. She shared her thoughts on the transition from collegiate to professional competition, and she described her rigorous training regimen. “Did you say 1,000 sit-ups a day?” one student-athlete asked when Richards-Ross rattled off her workout. 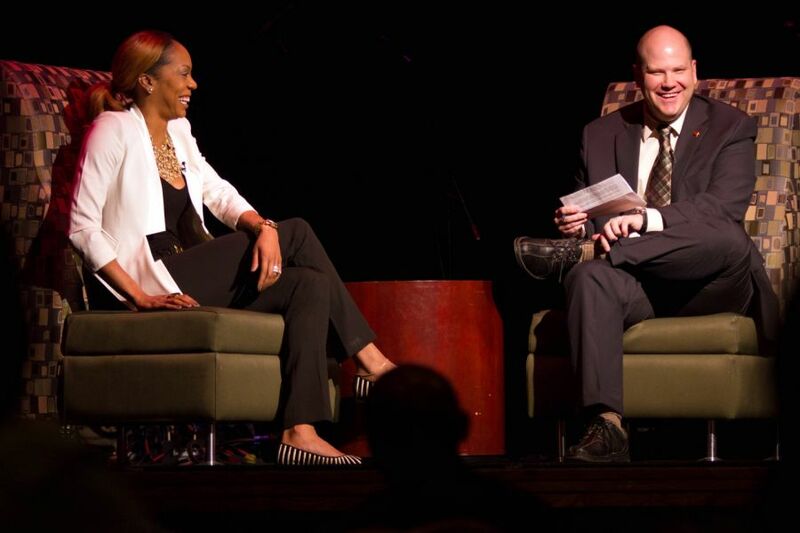 Olympian Sanya Richards-Ross speaks at the Black History Month Cultural Dinner. Richards-Ross spoke at length to both the student-athletes and the Cultural Dinner crowd about bouncing back from setbacks and how important her family and support network have been to her success. That success hasn’t come easy. The Jamaican-born Richards-Ross has struggled for years with an autoimmune disease, diagnosed as Behcet’s syndrome. In 2008, with years of training and hard work taking her to the starting block in Beijing, she settled for a disappointing bronze in the 400m. “After I got past the tears, I rededicated myself to the sport,” she said. She started training that much harder—yes, the 1,000 daily sit-ups are a part of her impressive regimen—to prepare for the next race. But she pulled her right quadriceps in 2010, knocking her out for an entire year. She returned in 2011 but won only two races—her worst season ever. But Richards-Ross, who’s been seeing a sports psychologist since 2008, knows the importance of mental toughness. She told the Illinois State crowd that she didn’t want to use injury as an excuse. “I realized in 2011 that no one is going to give it me. I have to earn it,” Richards-Ross said. That took her to gold in the 400m in London—a win shared with millions of viewers around the world. She also anchored the 4x400m American relay team to gold for the third consecutive time. The Cultural Dinner discussion, moderated by Illinois State’s director of trademark and licensing, R.C. McBride, opened with two questions from senior Redbird track and field throwers Tim Glover and Brittany Smith, Illinois State’s Athlete of the Year award-winners for the 2011-12 season. Glover asked about Richards-Ross’ support network of family and friends, which she described as vital to her success as an athlete. After coming to the U.S. from Jamaica, her father attended every one of her practices as a young runner. To this day, she wears a bullet necklace given to her by her mother. Richards-Ross talks with Illinois State’s director of trademark and licensing, R.C. McBride. Tackling a question from Smith about the transition from college to professional competition, Richards-Ross said student-athletes have to strike a difficult balance between school and sport, but they do have it easier because they have a support network to always rely on—from coaches prodding them into doing schoolwork or getting to practice, to roommates making sure they wake up on time. Richards-Ross turned pro after her sophomore year at Texas, forcing her to become independently disciplined when it came to her workout regimen and schedule. The Cultural Dinner was sponsored by University Housing Services along with Campus Dining Services, MECCPAC, Watterson Diversity Coalitions, Watterson Area Government, Association of Residence Halls and Black Student Union.